Military operations in the littoral domain are typically associated with the navy and the marines. In the future however, the U.S. Army will also play a key role in maritime and littoral operations. Developments such as the Joint Concept for Access and Maneuver in the Global Commons (JAM-GC), as well as the Asia Pivot, have compelled the army to consider how it can best contribute to possible future conflicts. One area where the army is seeking to contribute is in the maritime domain. 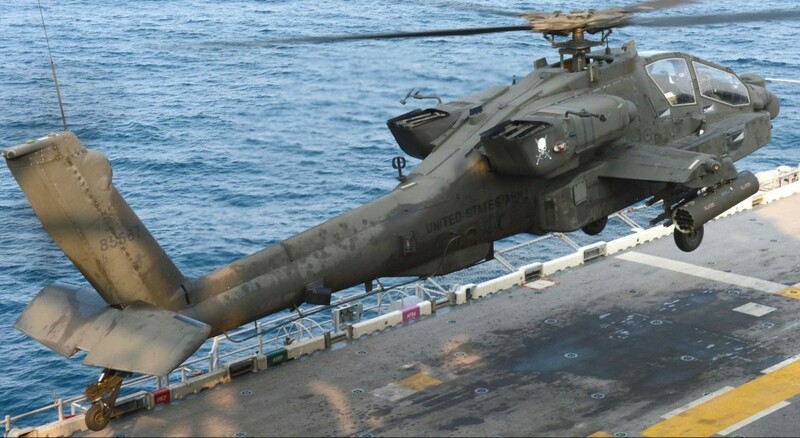 The army has been preparing its rotary-wing assets, especially the AH-64 Apache attack helicopter, to fight in the maritime environment. 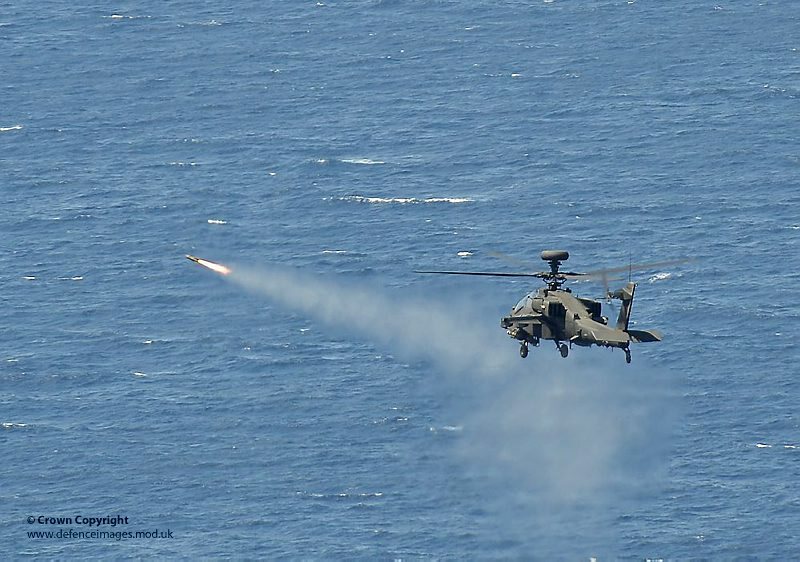 An Apache attack helicopter of 656 Squadron Army Air Corps is pictured firing a Hellfire missile during an exercise conducted from HMS Ocean. The army is modifying the Apache so that it will function better in a maritime environment. The Apache’s fire control radar will be upgraded so that it can more effectively detect and target small ships. Additional upgrades will also give the Apache the ability to better communicate and share information with assets from other services through a connection with LINK 16, a digital data link used widely by the U.S. Air Force and Navy. [vi] Further upgrades for operations at sea may also be necessary. 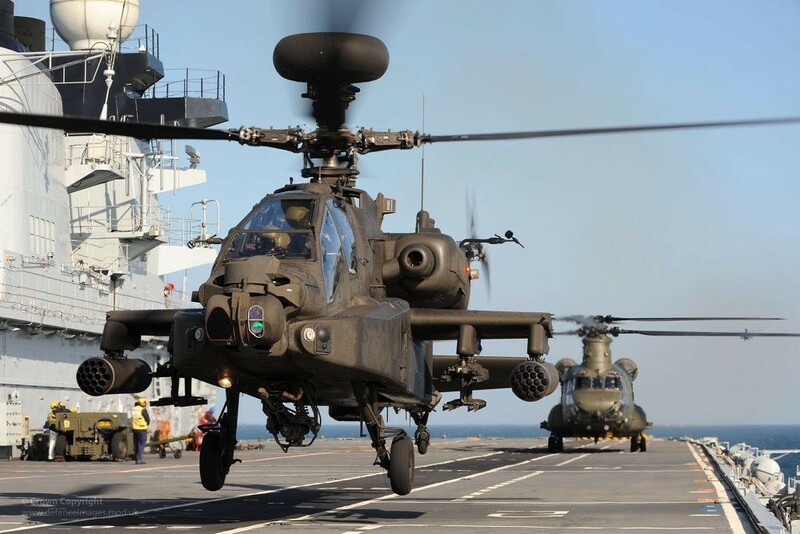 The British Army is seeking to configure its Apaches with flotation devices to enable crew members to ditch in the event of an emergency over water. [vii] As U.S. Apaches move toward maritime operations, similar modifications may be necessary. The Apache’s lethality is further amplified by its ability to interface with unmanned aerial systems under the manned-unmanned teaming (MUM-T) concept. The army is in the process of integrating the RQ-7B Shadow tactical unmanned aerial system into Apache units. [viii] Under this arrangement, Apache crews can receive data from the Shadow, and even take control of the drone itself. The development of MUM-T capability appears to be paying off for the Apache. In Afghanistan, some Apache units have received help from drones in 60% of direct fire missions. [ix] The ability to receive information from UAVs will provide Apache crews with greater situational awareness and improved ability to detect targets. Apache operating on USS Bonhomme Richard. U.S. Navy photo. In preparation for its new mission, army aviators have been working with their navy counterparts to develop Tactics, Techniques and Procedures (TTP) to effectively utilize Apaches in a maritime role. In 2014, the South Carolina Army National Guard’s 1-151st Attack Reconnaissance Battalion (ARB) sent several aviators to the Naval Strike and Air Warfare Center (NSAWC). During the exchange, U.S. Navy Rotary Wing Weapon School instructors shared information on Strike Coordination and Reconnaissance (SCAR) tactics to protect navy vessels in confined littoral waters. [x] Similarly, the Texas Army National Guard’s 36th Combat Aviation Brigade has also been developing TTPs for operations against small attack craft. In the Pacific, modern fast-attack craft such as the People’s Liberation Army Navy’s (PLAN) Type 022 ‘Houbei’ could also present a serious threat to the U.S. Navy. In recent naval exercises, the PLAN has emphasized the use of the Type 022 fast attack craft against aircraft carriers using multi-axis attacks. [xiii] The Type 022 packs a powerful punch for its size, carrying eight YJ-83 anti-ship cruise missiles with a 135 nm range. With growing challenges to U.S. military operations in areas such as the Persian Gulf and the South China Sea, the military will need to fully utilize and integrate the full range of its assets. The inclusion of maritime and littoral operations into the Apache’s mission spectrum constitutes an important step in furthering joint operations. Aaron Jensen is a PhD student in the International Doctoral Program in Asia-Pacific Studies (IDAS) at National Chengchi University (NCCU) in Taipei, Taiwan. JAM-GC is the successor to the Air-Sea Battle concept. [iii] “Army’s Apache fires first Hellfire missiles at sea,” UK Ministry of Defence, May 13, 2011. [vi] Kris Osborn, “Army Configures Apaches for Sea Duty,” DOD Buzz, October 13, 2014. Read a report some time ago that Apaches in S. Korea were training against NK maritime threats including infiltration craft.